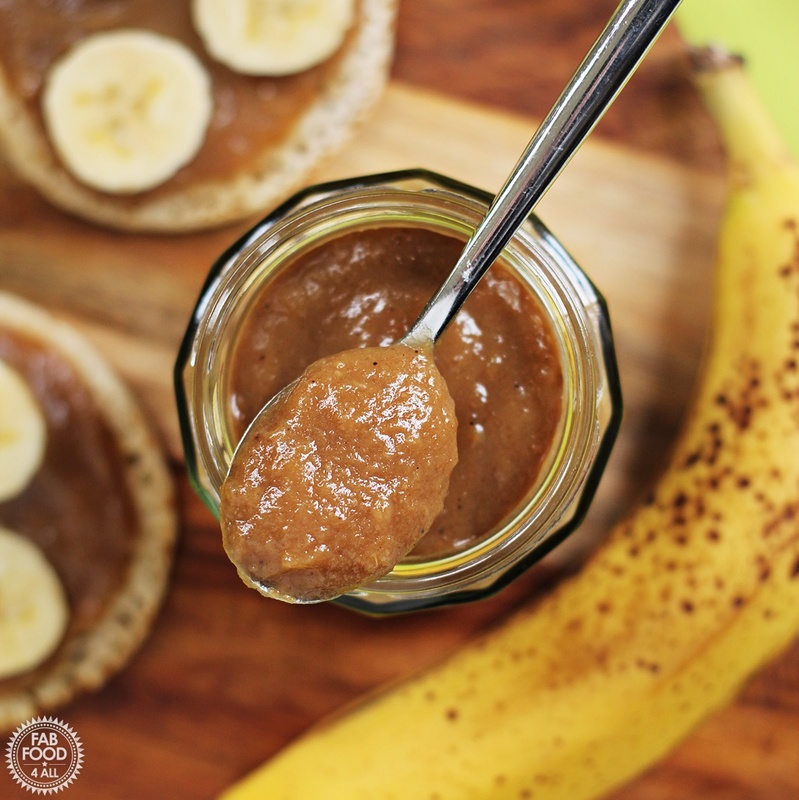 I’m very excited to share my Quick Banoffee Curd (Banana & Toffee Curd) with you today which takes just 10 minutes to make from start to finish! A house full of family over Easter and a poorly cat (Coco) has meant I haven’t had time develop any recipes recently but sometimes inspiration just hits you and Bingo! 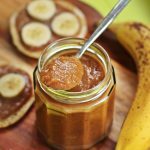 I came across Banana Jam the other day and that got me thinking about doing my own version which then lead to me thinking about doing something a bit different, a Banana Curd. I’ve adapted my Granny’s Quick Lemon Curd to become Blackberry Curd in the past so I decided to repeat this but with banana (I’ve put those links at the end). 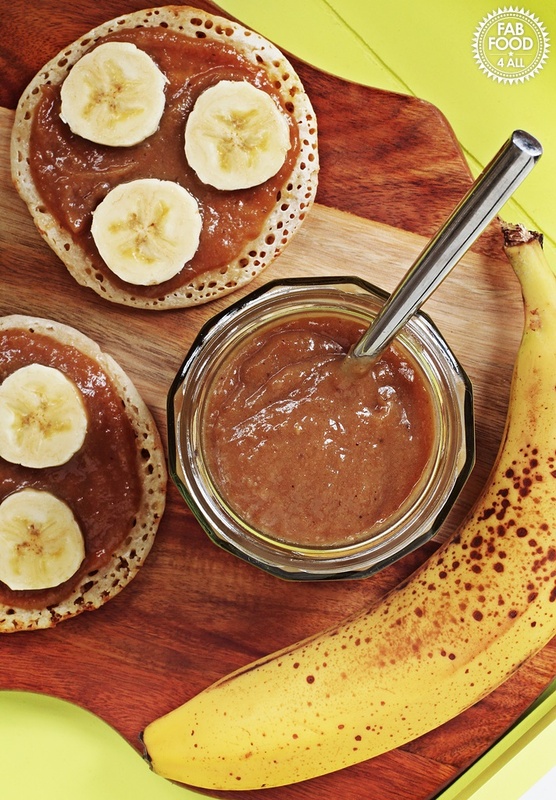 I do love bananas so you’ll find many banana based recipes on my blog! My head was swimming with so many variations of banana curd, I could add rum, go for a salted caramel flavour but in the end after doing a straw poll of my family I opted for banana and toffee flavour ie Banoffe. The toffee flavour comes from the inclusion of dark brown Muscovado sugar along with white granulated sugar and the inclusion of lemon juice and zest stops it from being overly sweet. You could always add rum or salt flakes to ring in the changes. So what did my Quick Banoffee Curd taste like I hear you ask! Well it was like a banana flavoured dulce de leche – so exciting! My family and a neighbour who popped by gave it a very big thumbs up. 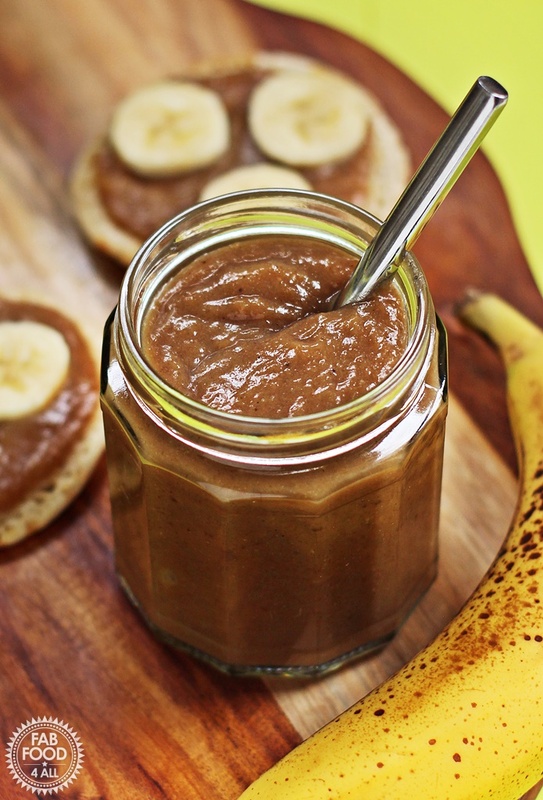 Now you want to know some uses for Quick Banoffee Curd don’t you! Well it would make a great filling for a Banoffee Pie, it’s great as an ice cream topping, in pancakes, as a spread on crumpets etc, swirled into Greek yogurt, a cake filling or addition to cake batter, add to homemade ice cream, a topping for a steamed pudding etc. I’m sure you can come up with some more suggestions so please add them in the comments below! Why not pin for later! 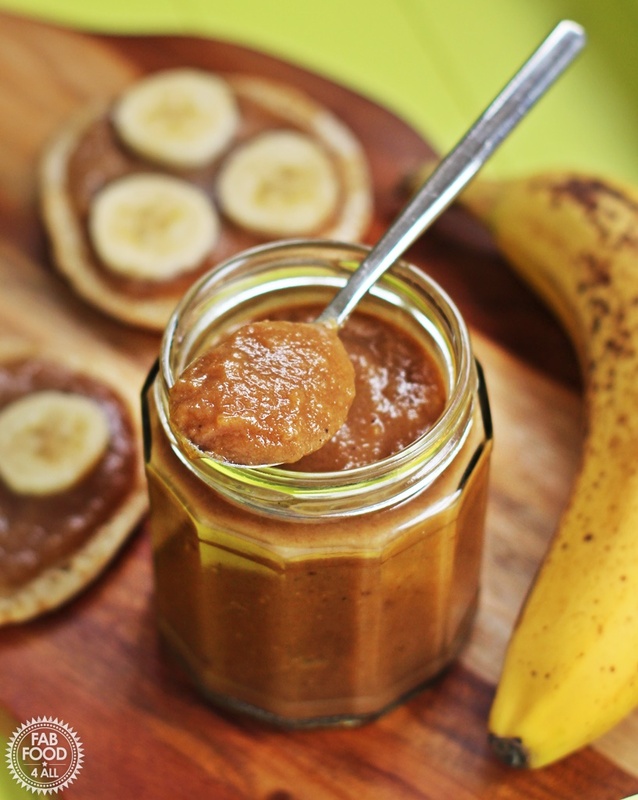 Banoffee Curd is simply delicious combining all the flavour of Dulce de Leche with banana in curd form! Put the banana pieces, lemon juice and zest into a blender and whizz until smooth (I used a stick blender). Pour banana mixture into a saucepan (I use non-stick) and add the sugars and butter. Heat on the lowest setting, stirring, until all the sugar and butter have dissolved. Turn the heat up very slightly until the mixture just starts to bubble, then briskly whisk in the beaten egg (pouring in a thin stream from a jug). The mixture will thicken up as you pour and should coat the back of a spoon. Continue stirring for another 10 seconds if necessary. Do not over-cook, you don’t want scrambled eggs! Pour into 2 hot sterilised jars and seal with lids immediately. Allow to cool, then store in fridge and use within 2 weeks. Serve as a spread, use as a cake filling, stir into Greek yogurt, use to top ice cream or could be used as a base for a Banoffee Pie etc. Sterilise 2 x 250 ml jars by washing in hot soapy water or take straight from dishwasher, filling with boiling water, emptying and then placing in oven for 20 minutes at 140°C then leave in oven until jam is ready. Washed lids should be sterilised with boiling water and then left to drain. Previous Post: « Monday Pie – great way to use up leftover roast beef! Oh this would be lovely with crumpets. A perfect afternoon treat with tea. Yummy! So could you use this in lieu of maple syrup on pancakes or waffles? Yes, I’d even pop in some banana slices too and some vanilla ice cream:-) Or I did just have it spread on a Scotch pancake the other day! Ok…so can I just eat this off the spoon? Wow….what a great idea. So many delicious ways to devour this sweet treat. I still think the spoon is the best option LOL!! 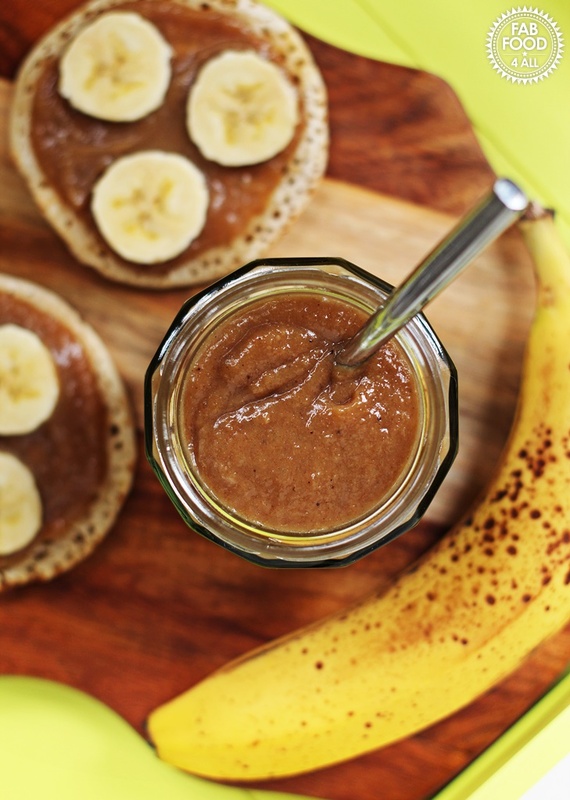 Wow this sounds soo yummy, perfect for breakfast! Camilla, this sounds amazing Sweet,creamy bananas toffy-fied, absolute yum in my books. Gotta try!